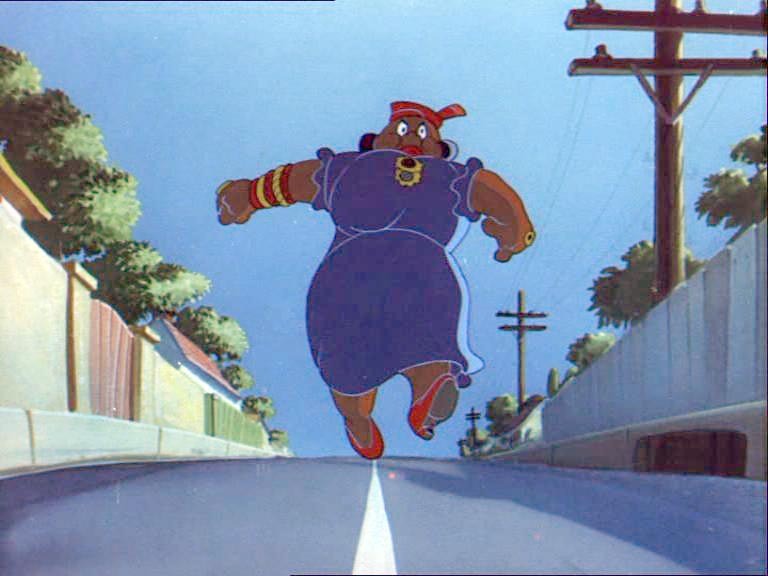 Many of us grew up watching Tom & Jerry on the tube, but if you’re old enough you remember the day Tom’s owner changed from a sassy black lady to a strident Irishwoman. Tom’s owner was never named, but the media latched onto her during the 80’s revisionism craze and called her “Mammy Two Shoes” because we almost never saw her face. People began saying she was a servant, when it was obviously her somewhat ramshackle but dignified home, and MGM had her legs bleached and her voice re-dubbed by June Foray as an Irish stereotype. The original voice, by black actress Lillian Randolph, was rarely heard again. As a child, I remember seeing some of the cartoons before the axe fell. I never thought she was a maid, and there are very few shorts that put her in a maid outfit- she’s usually in a slipper and housecoat, like a single woman reclining after a long day. In fact, in Mouse Cleaning, you can see her dressed up to go to church. That’s one of the few shorts where you get a glimpse of her face, albeit from a steep angle and her hefty bosom blocks most of it. The other banned cartoon, Casanova Cat, is the only one I recall her being in a maid outfit- it’s a fantasy short where Tom goes to call on his white cat beau, who lives in a penthouse. 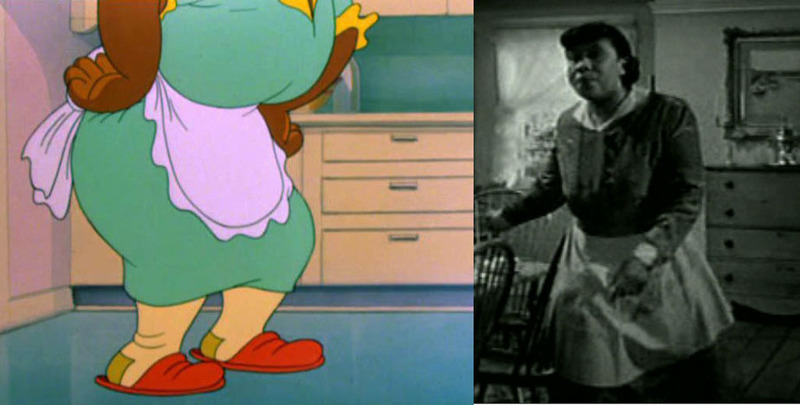 I’ll be the first to admit that Tom & Jerry’s jokes were crude, but I never felt there was a cruelty in how “Mammy Two Shoes” was portrayed. She does have an accent and inarticulate manner of speech, such as when she tells Tom, “if you is a mouse catcher, then I am Lana Turner! Which I ain’t.” When she clamors for Thomas to “git in here and get that mouse!” when she’s screaming up on a chair, she looks no more ridiculous than any white female cartoon character did when they did the same thing. If anything, the old cartoons use of blackface- whether it was Tom & Jerry or Looney Tunes, or anyone else- shames us because it’s so offensive today. But if you look at the history of cartoons, racial caricature is pretty even handed. There’s a Hogan’s Alley of Irish cops and Italian criminals, French gendarmes in the Pepe le Pew cartoons, and even the Dover Boys spoof of college boys goofs on whitebread folks. If anyone should be offended by cartoon caricatures it’s the Japanese, who really got some hateful cartoons made about them during World War 2. The classic cartoon Coal Black and de Sebben Dwarfs, shows the evil queen sending hit men who have a sign that reads: Rub outs – 10 cents, Midgets half price, Japs- FREE! In a short full of black caricatures, that ends up being the most offensive part, until you realize the context- it came out in 1943. The Tom & Jerry shorts won more Academy Awards than Disney’s or Warner Brothers’, but I feel they jumped the shark when Chuck Jones came along and reworked the characters. 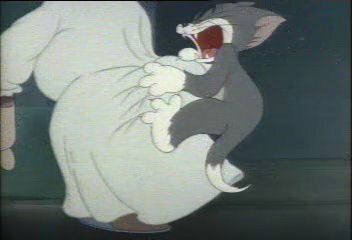 I like Chuck- Hell, I have a tattoo of Pepe le Pew in an undisclosed location– but his Tom & Jerry are way too much like a mute Sylvester and Tweety. They lack the great character of the originals, where Jerry was a tiny Chaplin tramp and Tom was lazy and only chased Jerry when Mammy threatened him with sleeping outside. 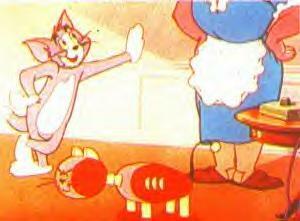 My favorite of all time is perhaps Heavenly Puss, where Tom loses his 9th life and is going to Cat Hell unless Jerry signs an affadavit forgiving him for all his trespasses. It deservingly won the Oscar that year. 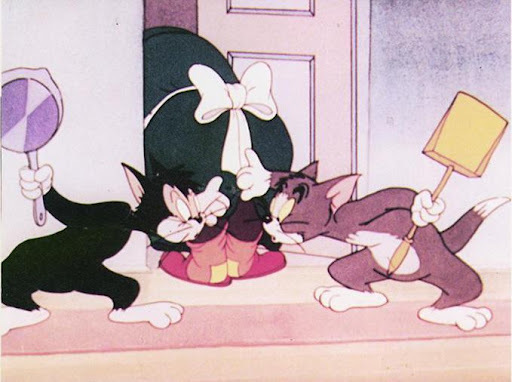 You can find many of the original cartoons on youtube, and MGM has released most of them in original form in the Tom & Jerry Spotlight Collection DVD sets. The third set omits two cartoons- Mouse Cleaning and Casanova Cat- and several are edited. But we take what we can get. Warner Brothers has said that they’ll release all the Looney Tunes uncut eventually, and I wish MGM would do the same for the Tom & Jerry toons- even if they make it some special collector’s set with big warning labels on it.